Open discussion by top graft-buster Wang Qishan about the legitimacy of the ruling Communist Party – a topic long deemed unquestionable – has raised the eyebrows of some commentators. “The legitimacy of the Communist Party of China derives from history, and depends on whether it is supported by the will of the people; it is the people’s choice,” Wang said when meeting some 60 overseas attendants of the Party and World Dialogue 2015 in Beijing on Wednesday. ADVERTISING Analysts said the aberration was a step forward but some disagreed with Wang’s interpretation of “legitimacy”. Zhang Lifan, a Beijing-based commentator, said Wang’s remarks reflected a shift of attitude in the party as a result of intensified social conflicts and increasing pressure from an underperforming economy. “Its legitimacy was maintained by relying on economic growth, but now economic growth is facing problems. In the past people thought [the party] could continue governing and did not have strong opposition to it because they still had money in their pocket. Now the size of their pockets have shrunk,” he said. Zhang Ming , a political scientist with Renmin University, applauded Wang’s courage, but disagreed with his use of “legitimacy”. “You can’t talk about legitimacy merely from a historical perspective. How to let the people express their approval or disapproval [of the government]? The ballots are the most obvious way,” he said. Steve Tsang, a senior fellow at the China Policy Institute of the University of Nottingham, said the “legitimacy” Wang mentioned did not mean democratic accountability. “The will of the people, in China’s political reality, is collected and reorganised into something in line with what the party wants,” he said. 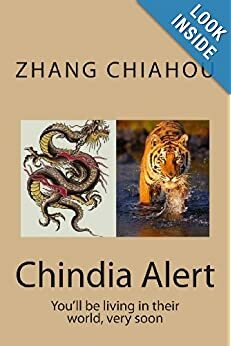 Two years later, the upper echelons of Chinese leadership appear to have come face to face with a realization that’s true all the world over: slimming down is hard to do. In a communique released Tuesday, the Organization Department of the Communist Party’s Central Committee said that the party boasted 87.793 million members as of the end of 2014. The figure – which exceeds the entire population of Germany – represents a net increase of 1.1 million from a year earlier. China is in the midst of a sweeping anti-graft campaign under President Xi Jinping, with announcements of corrupt officials’ investigation and ouster from the party a near-weekly occurrence. Along with that crackdown has come a steady stream of warnings for party members to rein in behavior ranging from their mahjong playing to the use of terms like “dude” or “boss” when addressing their superiors. At its heart is the pursuit of the party’s survival. Xi and other top leaders have made a point of reminding cadres that the Chinese Communist Party must avoid the same pitfalls that brought about the demise of the former Soviet Union – particularly disloyalty to Communist ideals – with some Chinese scholars warning that the Soviet collapse came when the ranks of its Communist Party had swollen to an unwieldy 19 million, or nearly 10% of the Soviet Union’s adult population. The membership of the Chinese Communist Party currently stands at about 7.8% of China’s adult population. Yet despite a vow by China’s Politburo leaders to limit the party’s size and purge “unqualified members,” statistics released by the Organization Department show that membership has actually grown over each of the past four years, albeit at an increasingly slower rate. 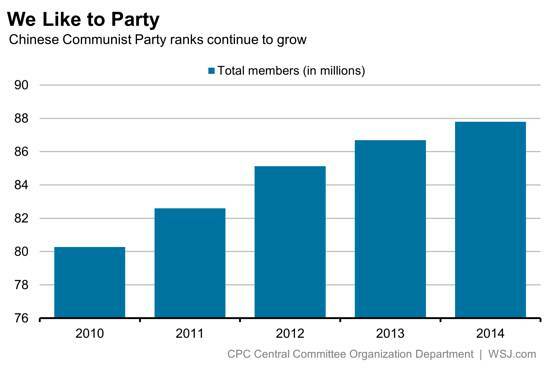 via China’s Communist Party: Still Big, and Getting Bigger – China Real Time Report – WSJ. Zeng Fanyue is a 24-year-old political science graduate student at Shanghai’s Fudan University. Politically speaking, she’s redder than red. “As a Communist Party member, I have additional social responsibilities. I should help people and do things for others,” she says, telling how she choked up with emotion during a ceremony in which she renewed her oath of loyalty to the party. 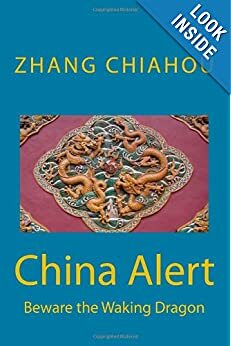 The government of President Xi Jinping, who’s also chairman of the Communist Party of China (CPC), says it wants more true believers like Zeng. At the same time, it wants to weed out the party’s corrupt members. Last year the number of Chinese joining the party dropped 25 percent as young people saw little to gain from joining an organization in convulsions over the prosecutions of party notables such as ex-Chongqing boss Bo Xilai and former Security Minister Zhou Yongkang. In just the first five months of this year, authorities investigated 26,523 officials, including seven at the ministerial level, for crimes related to their jobs, reported the official Xinhua News Agency on July 3. The CPC—now 87 million strong—is facing “severe dangers,” particularly from corruption, Xi warned in a June 30 speech. Three weeks before Xi’s speech, the party had issued new recruitment rules, the first major revision in 24 years, that aim to further slow the growth of the world’s largest political organization. Only people likely to be so dedicated to party doctrine that they won’t succumb to the temptations of graft will be welcomed. via China’s Xi Enlists Party Recruiters in Anticorruption Effort – Businessweek.